While libraries are always working to promote literacy, those efforts are getting a little extra push at CADL Stockbridge this spring. With storybook character visits (Llama Llama and Ladybug Girl) and preschool storytimes and crafts, as well as an invitation to kids to read to a specially trained golden retriever, there are lots of reading-related events going on. The library is also partnering with Heritage and Smith Schools in efforts to promote literacy. 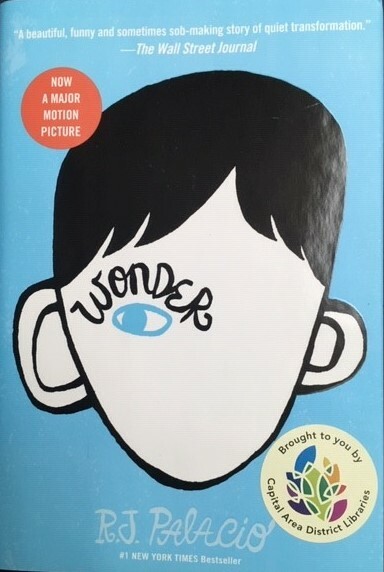 At Heritage, this means providing 400 copies of the award-winning book, Wonder, by R.J. Palacio, for an all-school kids’ community read. The book, chosen by the school, is a great fit for their March is Reading Month theme–Choose Kindness, Choose Books. “Studies have shown that having your child read at home for just 20 minutes a day will help improve their reading ability,” notes Sam Huber, a librarian on the Stockbridge staff who developed the program and partnership. The program will give 2nd graders prizes for doing just this—reading 20 minutes a day—including a free book when they complete the challenge. The “20 a day paves the way” program for 2nd graders runs from April 8 to June 7, 2019. Students can pick up prizes at school or at the library. In connection with “20 a day,” the library is also hosting Family Literacy Events, designed to give parents and guardians of Stockbridge 2nd graders a toolbox of tricks to support their children to become stronger readers. While the parents catch up on tips and tricks, children will be treated to the tales of storyteller extraordinaire Jean Bolley. These April events require registration; 2nd grader families are invited to do that by calling the library at 517-851-7810.